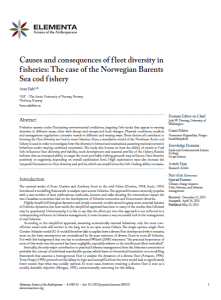 Article: Causes and consequences of fleet diversity in fisheries: The case of the Norwegian Barents Sea cod fishery. Causes and consequences of fleet diversity in fisheries: The case of the Norwegian Barents Sea cod fishery. The environmental conditions in which fisheries operate, as well as the targeted fish stocks, fluctuate and differ from one location to the next. Fishing vessels are constantly constrained by these physical conditions and also markets and management regulations. It is a combination of all of these factors which creates the fleet diversity that is so evident in most fisheries. The author explores a simulation model of the Northeast Arctic cod fishery in order to see how fleet diversity is both formed and maintained. The article also examines how a vessels ability to find fish influences fleet diversity, profitability, stock development, and seasonal profiles of the fishery.